You must be a member of the Tokyo Wine Lovers Group to attend this activity. Would you like to join this group? We would like to invite you to a series of three unique wine Trainings & Tastings with French taste expert Hadrien Mathieu. 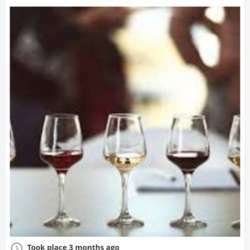 Each session will allow you to learn the fundamentals on oenology, wine tasting vocabulary, winemaking techniques, wine culture (viticulture) and will take you through a wine “Tour du Monde”. The workshop is for all levels, professional Hadrien Mathieu will be able to answer your personal questions. Each participant will taste and discover a minimum of 6 prestigious wines at each session making a total of 18 nectars over the 3 sessions. This will allow you to learn about the variety of the different noble red grapes or noble white grapes used throughout the world to produce the best tasting wines. Small appetizers will be served for the purpose of supporting the tastings. Hadrien has over 20 years’ experience in taste, is a “fin connoisseur” when it comes to good wines and good food, he grew up in a family who cherishes prestigious wines and he manages his own wine cellar with good, old and valuable wines. He is an authentic “gourmet” and will transmit his passion about good tasting wines.